Heroes of the Realm is a free-to-play browser-based game that mixes elements from several genres: simulation, card battle/collection, and strategy. The result is an extremely diversified and addictive game with some fantastic artwork. 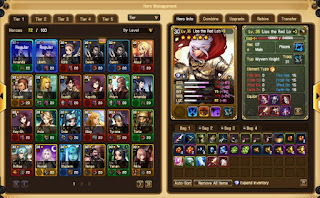 The game offers over 350 unique heroes to collect and battle with. You have the ability to customize your formations and hero squads, using strategy to win the combats. Fight against other players in PvP combat and combine heroes to unlock special heroes that can turn the fate of a battle.